On the Prairies winter wheat is planted in the fall and harvested the next summer, as opposed to spring wheat which is planted in the spring and harvested in the fall. 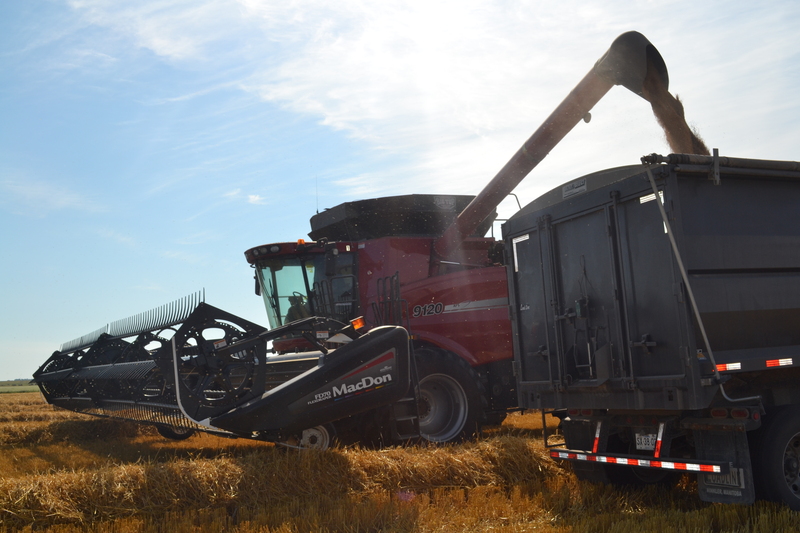 Last week we harvested approximately 400 acres of winter wheat on our farm. 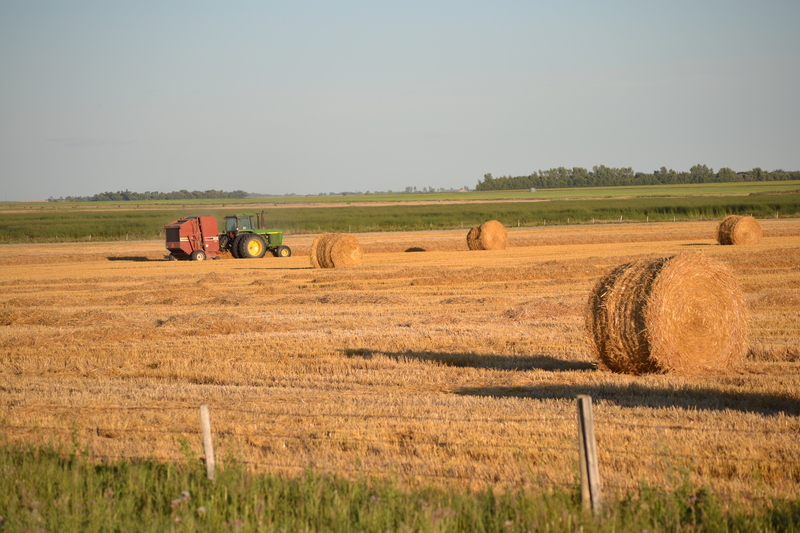 Here are some photos from our winter wheat harvest. 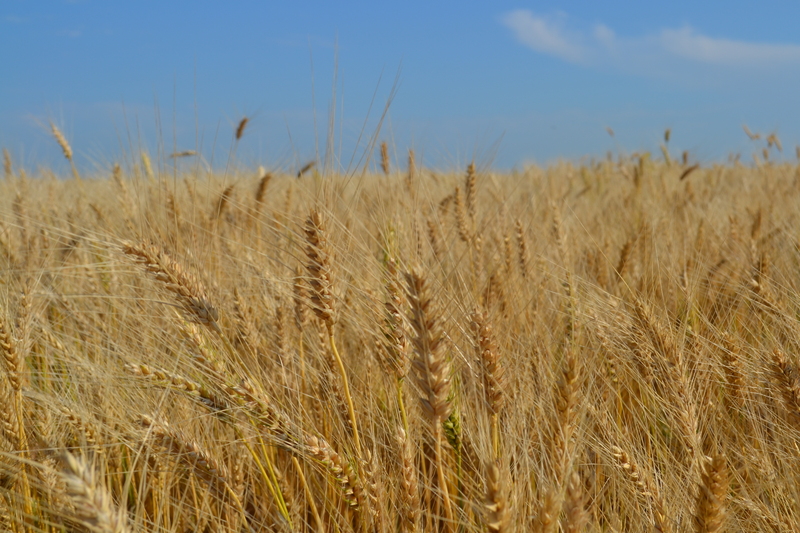 A beautiful golden crop of winter wheat. This year we straight cut the winter wheat rather than swathing it first and then combining it. You can see the long straight header mounted on the front of the combine in the photo below. 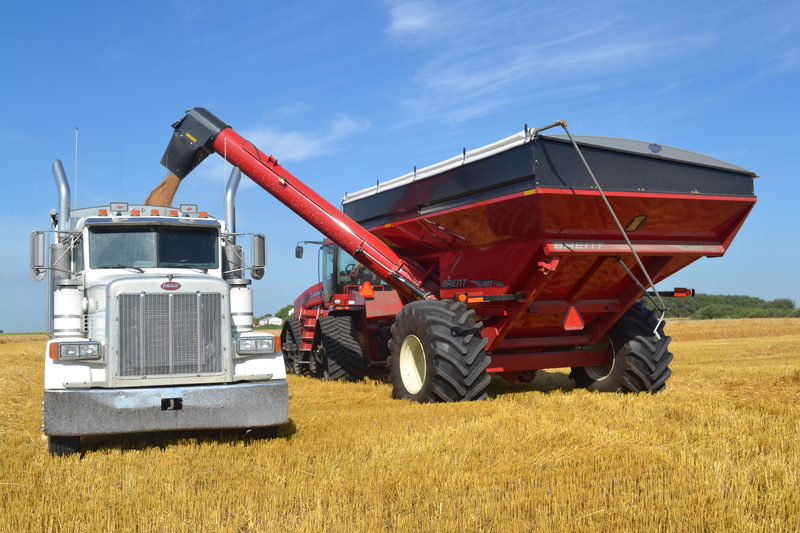 This year we bought a grain cart, which is the big red cart pulled by the tractor in the photo below. The process usually is: the combine (pictured above with the straight header on it) harvests the winter wheat; once the combine has a full hopper it dumps the winter wheat into the grain cart; the grain cart then dumps the winter wheat into the grain truck; and the truck brings the winter wheat to the yard where it’s unloaded into the grain bins (pictured further below). 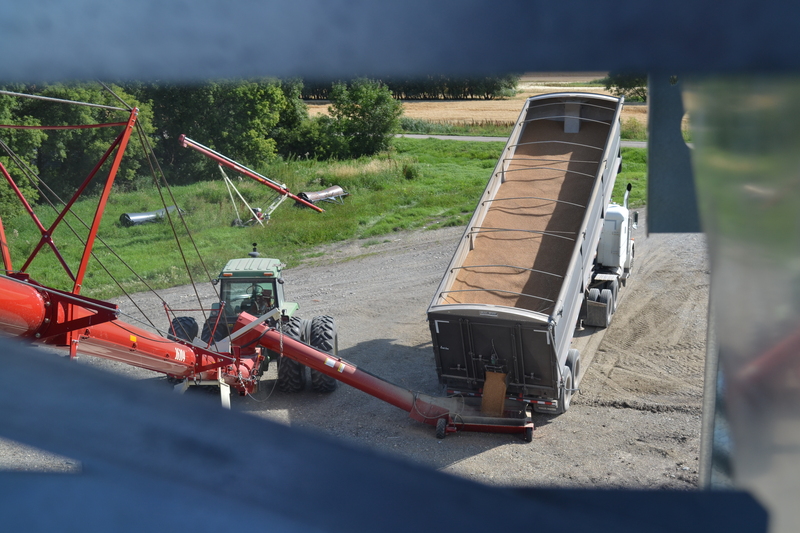 Unloading winter wheat from the grain cart into the truck. Unloading winter wheat into a grain bin. This was taken from the steps of a big grain bin. While the crop is being harvested, the combine is collecting the wheat seed in the hopper and dropping the straw out the back into neat rows. 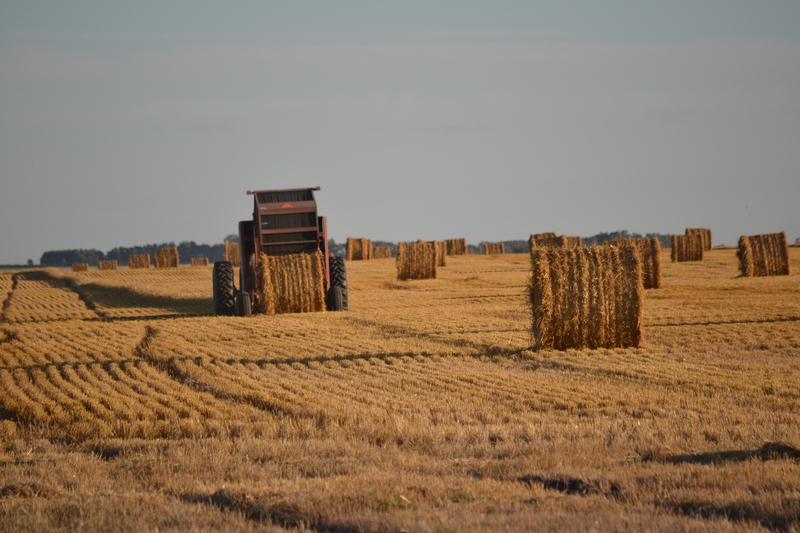 This straw is later made into round bales with a baler (pictured in the photos below). 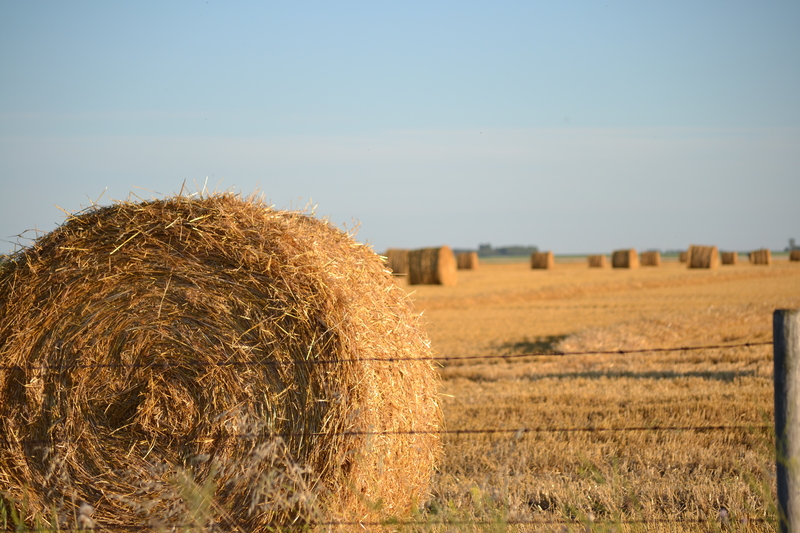 These straw bales are used as bedding for the cattle in the cold winter months. Out pops the round bale! Rows and rows of straw bales. If you have any questions, please leave a comment below. I’m happy to answer your questions. Nice summary of the process. Thank you. Great blog post…oh I just noticed it’s a few years old! I found you through a Google search!